After spending the holidays with my family and recently visiting the Olympus Spa (Korean spa), I felt inspired to get back to my roots and back on the Korean recipe train. 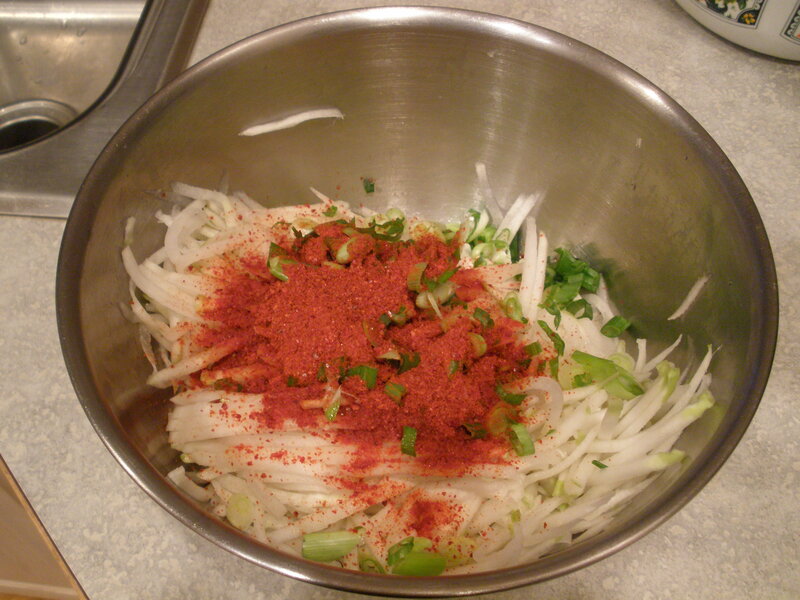 This is a simple traditional Korean side-dish and recipe from my mom. This is usually served in banchan (small side-dishes that are served before and with a Korean meal). If you ever visit a Korean household or go to a Korean restaurant, banchan is always served. Kimchi is not only healthy because it’s a vegetable, it also has all natural pro-biotics which helps to establish the flora and “good bacteria” in your gut and intestinal linings (similar to sauerkraut, kombucha, and any other fermented food). It is great for balancing your digestive system. Also, ever wonder why many Koreans look younger than their age? It’s because they eat a lot of kimchi. 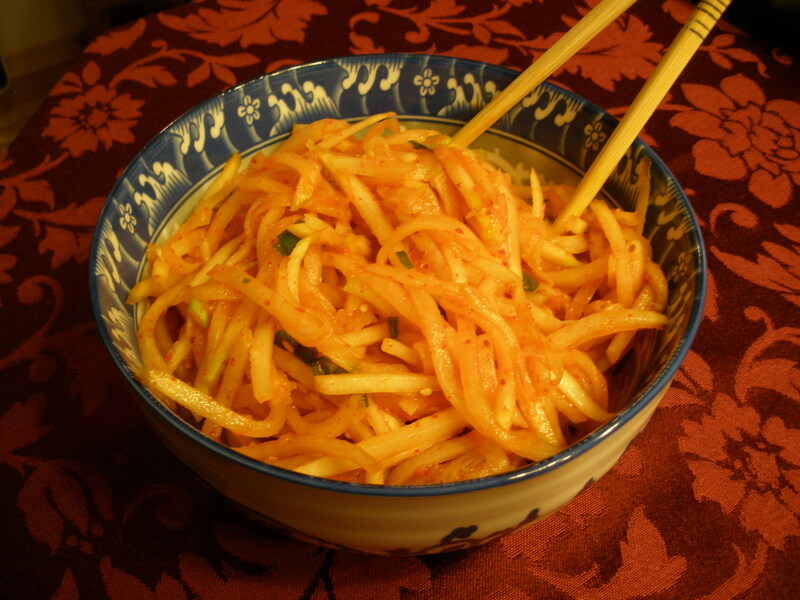 gochugaru (Korean red pepper) – available at your local Asian market or grocery store. Tupperware or glass jars for storage. 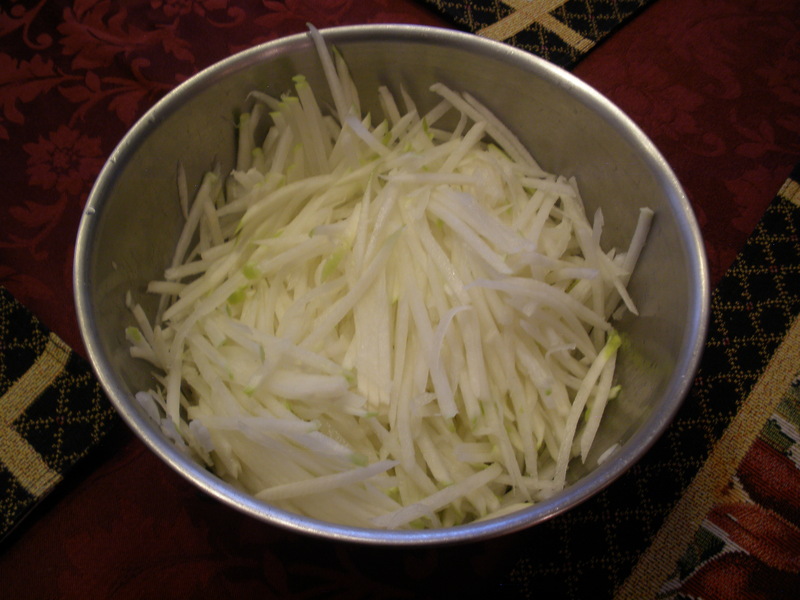 Grate Korean radish in a large bowl. Add chopped green onions, minced garlic, 2 tbsp of vinegar, 2 tsp of sugar and gochucaru (approximately 3 tbsp, but can add as much as you want to reach the desired spice level. The more you add, the spicier it will be). Hand mix with latex gloves to make sure all the ingredients truly blend together. Add more salt to taste if needed. Serve immediately with steamed rice and with your main Korean dish, or store in fridge to be served later. Kimchi will continue fermenting in the fridge. If after a few days or weeks, it gets too “sour” tasting, you can use your saeng-che leftovers to make kimchi jigae (spicy Korean stew). Recipe to come later. Next ›An Exercise on Identifying Your Behaviors and Thought Patterns.